Complimentary for Vice President / Directors & above. As the trend of Open Banking takes hold of the unbundling and re-bundling of the value chain of financial services – so that products, services, data, and functionalities can be consumed and provided for by third parties, banks will become increasingly adept at data monetization. However, it requires huge changes such as re-evaluating how businesses generate and consume data as well as restructuring the business structure to win in the era of Big Data. Join our industry leaders to discuss how to create a new data driven value chain and generate new value from the data. IDC Financial Insights predicts that banks will expand the horizon and move to a wider corporate-based API plan in the next two years, offering access to transaction banking processes, such as cash management, liquidity management and treasury. Join the discussion to find out how banks are transforming their corporate banking space with API and Open Banking. Faster engagement, streamlined process, optimized resources and - cost are pushing Financial Services Institutions (FSIs) to explore new technologies and entrants, as well as business models to rethink how they should enable their customers to move money. Stakeholders across the payment value chain — card issuing banks, merchant acquirers, payment networks, and payment processors — face increasingly complex decisions. An amazing tool when used correctly, Blockchain has the potential to be the absolute game changer in many areas of financial services. Join the Blockchain journey where we are not only going to discuss which situations blockchain works best in, but also where you should not be using it. In 2019, we expect to see more initiatives from Asia/Pacific financial institutions to implement personalization in their products, services and experience deliveries. Key highlights that FSIs need to watch out for personalization in Customer Experience (CX) include Strategy and Capabilities, Channels and Analytics, and of course People and Technology elements. When looking to create a personalized experience regarding of where, when or how a customer choose to engage, it’s key for financial institutions to gain the understanding of customer data and act accordingly. Join the discussion at Journey 5 to know more about the latest development of Personalized CX in the region. Discuss how to deliver a consistent and personalized experience by understanding the voice of your customer, ensuring meaningful engagements based on customer insights. Digital Transformation has driven financial institutions to create and deliver their products and services on new channels. However, delivering exceptional customer experience goes beyond launching digital channels, but treating customers as one person across channels to deliver true end-to-end digital experiences. Join Journey 6 where the discussion will concentrate on how to deliver personalized, connected and compliant omni-channel experience for your customer in the digital era. While the openness and connectedness of the financial industry has integrated new services and channels to our customers’ lifestyle, vulnerabilities for fraud and attacks have also grown exponentially. The new interlaced financial services demand high-performance, high-vigilance monitoring and remediation tools that can safeguard the value-chain, as well as being practical in the digital economy. Automation has created a lot of buzz recently. But only a couple of financial services institutions in Asia Pacific have been able to scale their RPA deployment. What are the key mistakes to avoid with artificial intelligent and where is it bound to fail? Join the discussion as our industry leaders lead you to the latest developments on intelligent automation and what lies ahead. Table A15: Empowering the Intelligent Enterprise with Scalable and Connected RPA – Delivering Results! 2019 is the year to broaden Insurance’s horizon and break free from the traditional mindset, building a larger insurance market place and ecosystem. Join your peers from the Insurance industry to discuss how to leverage platform-based solutions and be a pioneer in building alternate revenue streams from multiple partnerships. At the same time, take away best practices in mastering data sharing and data practices, as well as understand how data compliance can be a major hurdle to the digital transformation journey. Complimentary for Junior Executives / Managers. Data First Transformation has been going on in top financial institutions across Asia/Pacific to identify new business opportunities and elevate their services and products. By analyzing the data available effectively, it is possible for everyone to make good strides and deliver positive business results in financial services sector. However, with the huge amount of data, which seems more than enough, how can you present the data in an effective and useful way? What are the tools you can take up easily to assist you making analytical decisions? How can you transform the results of data analytics to actional insights? Join this hands-on workshop, where our industry experts and practitioners help you pick up the easiest-to-use skills to better see, understand and present the data you have at daily work. The workshop will be conducted in a highly interactive and hands-on format, to ensure you take away practical methods and skills surrounded by a gamified environment. How Intelligent Automation is Changing the Face of Financial Services in Asia? Financial institutions are becoming increasingly adept at data monetization for a digitally connected business. However, challenges remain such as huge changes on the way how businesses generate and consume data, and how to restructure the business processes and platform components so that employees can engage with real-time data. Join us and the industry leaders to discuss how to create a new data driven value chain and generate new value from data by bringing together data, systems and people. Widespread uptake of open banking globally is leading to new opportunities and challenges for banks. Banks in Asia/Pacific are exploiting the directive to create new business models aimed at creating deeper relationships with customers and at generating new revenue streams. Join us for this engaging discussion on how banks in the region are proceeding to building an API-based end-to-end integrated architecture and collaborate with other players in the banking ecosystem. 2019 is the year to broaden Insurance’s horizon, break free from the traditional mindset, and build a larger insurance market place and connected ecosystem. Join your peers from Insurance sector to discuss how to master risks in digital transformation journey by building a sustainable platform-based insurance ecosystem. While the openness and connectedness of the financial industry has integrated new services and channels to our customers’ lifestyle, vulnerabilities for fraud and attacks have also grown exponentially. 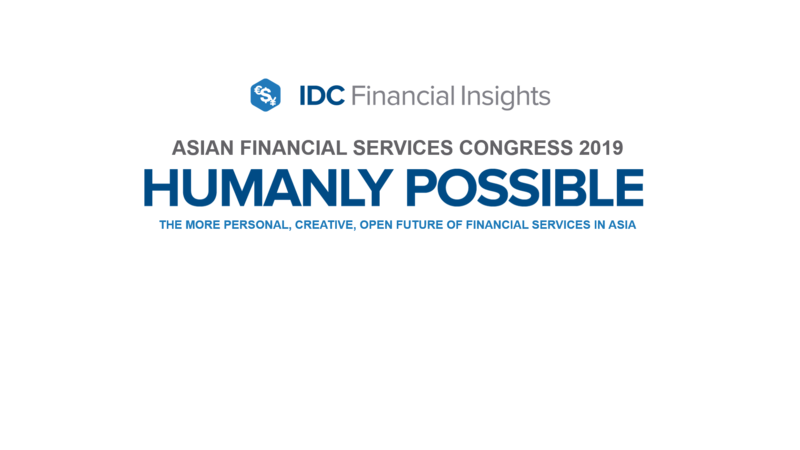 IDC Financial Insights will be unveiling our latest findings on how FSIs should react to the regulatory clarity on cloud and safeguard the value-chain from internal and external threats. FinTech players are leveraging technology advancement to close the gap for individuals and businesses to access to useful and affordable financial products and services in a sustainable way. At this forum, we will explore how SMEs, banks and other financial institutions can leverage FinTech innovation and collaboration to promote financial inclusion in Asia and beyond. At the Asian Financial Services Congress, our Focus Group Discussion (FGD) segment provides an effective way for our delegates to discuss a specific topic of interest, without any presentation decks. The participants will be guided by moderator (or industry leader) who introduces table topics for discussion and helps the group to participate in a lively discussion. We have designed 9 Focus Group Discussion Journeys, to address some of the most critical issues facing the Financial Services Industry in Asia/Pacific. Upon registration, please select your preferred focus area / FGD journey. Within your selected journey, there will be two rounds of discussions. Each discussion will last for 40 minutes. At each discussion table, you will be joined by 8 to 10 fellow delegates, along with two industry leaders. When the time is up, the leaders will move to the next table within the journey. You will be greeted by another set of leaders who will then lead you on the second and final round of discussion. How To Make Valuable Decisions Fast with Big Data?